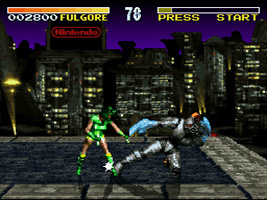 A port of the arcade fighting game Killer Instinct. While sacrifices had to be made to graphics and sound due to hardware limitations, the game kept much of the gameplay intact and added some new features, including Training and Tournament modes. The Super Nintendo version was also packaged with the "Killer Cuts" CD, featuring remixes of several music tracks from the game.